Langs masterpiece is a terrifying excursion into an urban underworld where it is difficult to distinguish morally between the activities of organized crime and organized law enforcement. Peter Lorre gives his immortal performance as a pathetic child murderer pursued by both the law and the syndicate. 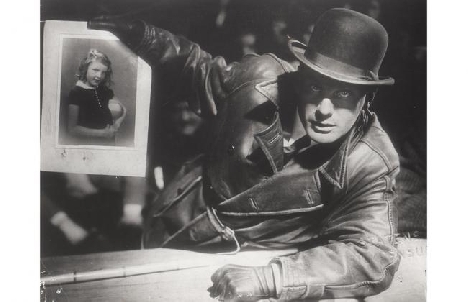 In the rigor of its construction, where theme, style, and mood all express a kind of entrapment that is at once psychological and based in reality, M is a precursor not only to Langs American films but to American film noir in general. Sound is used ingeniously in this 1931 film, with music limited to the Peer Gynt theme which both torments the murderer and hauntingly announces his presence in place of the image. Few films have so successfully fused atmosphere with plot, image with sound, and expressed gestures with those unexpressed but felt.